This is beautiful, and I hate pink! You play as Aurora, a little girl who falls ill with a sleeping sickness. When Aurora awakes, she is lost in Lemuria, a world where the sun, moon and stars have been stolen by Umbra, Queen of the Dark. Aurora is alone at first and looking for her father. In order to find her father she will need to help the people of Lemuria recover their coveted sources of light. Aurora meets a lot of characters along the way with similar goals as her own, and all are eager to join the party. 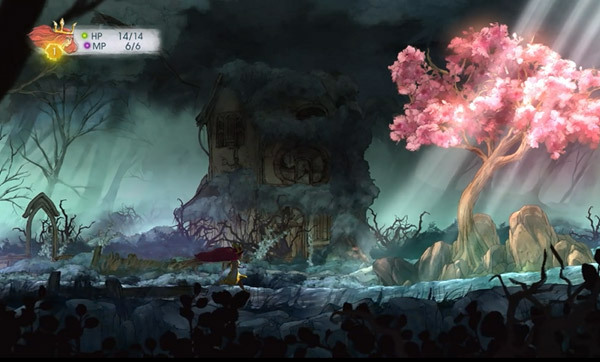 Child of Light, is a great combination of side-scrolling / puzzling and classic RPG. The tutorial of the game is very nicely integrated into the gameplay. There are non-intrusive messages that show up in the background of the screen when you gain a new ability, such as flying or healing with Igniculus the firefly. Navigate through thorns and blind your enemies. 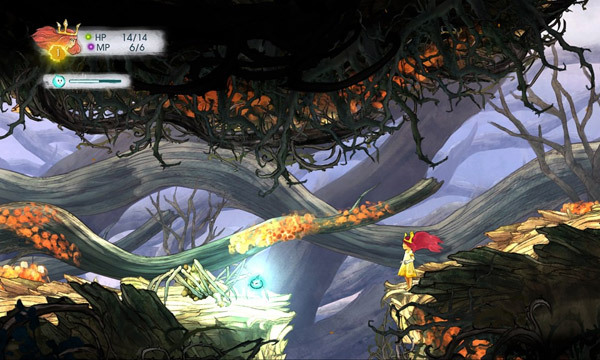 The platforming side of Child of Light becomes very flowing once you learn how to fly. There is a lot of navigating of dangerous terrains. 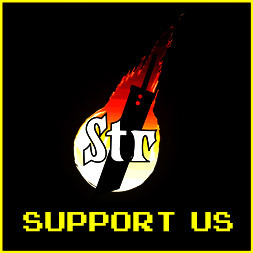 Environmental obstacles such as lava, wind, thorns, waterfalls and so on, can actually hurt your character outside of combat. Along the way there are some small, fairly simple puzzling aspects to the game. The overall theme in the game is of light and darkness. 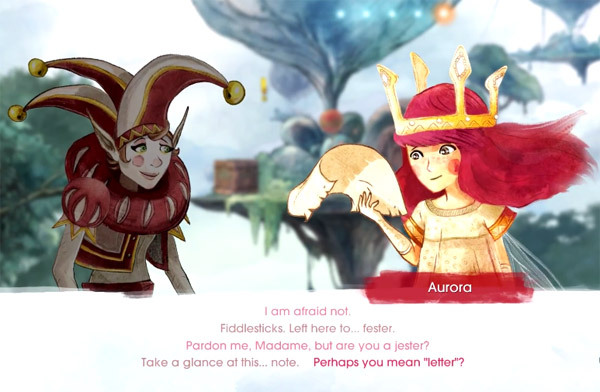 As Aurora you will need to use Igniculus’ light and your own to not only navigate, and light your way, but also to solve puzzles to open doors and find treasure. Light is very key in this game, it can heal you or it can blind and even devastate your enemies. This dynamic of the game is used in and outside of combat. 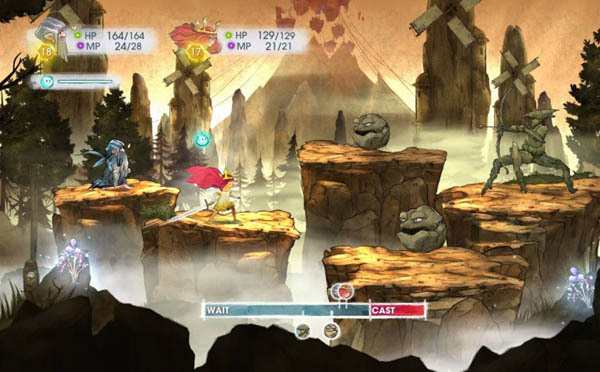 Child of Light has a very classically crafted RPG battle system with a few nuances. Each battle is a real-time turn based style, with an action / initiative bar that times each character or monsters actions. The most interesting feature of battle is Igniculus. Igniculus is controlled by the right analog stick and can blind your enemies with his light or heal you and your party. This little firefly ally cannot be attacked or reached by your enemies. However, Igniculus does have a set amount of light, and when it runs out, he needs time to recharge or collect from flower-like objects. The bottom-line is, I love puzzlers, platformers and RPGs, so the gameplay is a blast. The graphics in this game aren’t next-gen or mind blowing, however, the art style is. 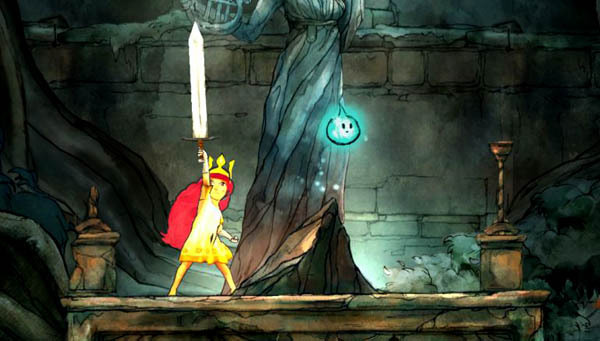 Child of Light feels very much like a beautiful bedtime story brought to life. Masterful water color paintings that have fully articulated motion. Playing this game is like living in your favorite children’s book. Everything is so beautiful, flowing and fairy-tale-like. I love that the game starts with little Aurora, who can barely hold her sword, and even swings it like only a child could. The surreal physics of this game are so spot on, and really close the deal for me. I find myself humming along during each battle. Even when I am not playing I will whistle the title theme. The musical theme is very strong in Child of Light and it burrowed its way deep into the cracks of my dark soul. The “cut-scene” narrative is very much like a mom telling you a bedtime story, and really pushes the game forward. However, pretty much every line in the story / dialogue rhymes, as annoying as this sounds, the writer sells it pretty well with a sense of humor. The gameplay’s combination of puzzle, platform and role play are solid. I played the game through on Expert skill level, this really enriched my experience, it felt like I earned every bit of story. I wish I had a game like this when I was a kid. Hipsters and EMO kids, I understand why you love this AAA “indie-like” title.